When it comes to building fun, durable and safe play structures and cool outdoor toys, the folks at Gym Dandy are, in our view, among the best. They only make four pieces for children and three of them are teeter totters; the other is the Easy Outdoor Space Dome. All of their outdoor toys for children are well-built and have weight limitations that allow parents and grandparents to play too. And, while you and your kids might lose an opportunity to show off your style at the local playground, you’ll be able to enjoy years of fun right in your own backyard. Today, we’re focusing on two of their teeter totter toys; the TT-210 and TT-320 models. We’ve already shared their super cool Spinning Teeter Totter with you. But, here’s a quick overview of it along with the other two see-saws Gym Dandy makes. * Prices vary, however, most online vendors we looked at were generally selling the all of the Gym Dandy riding toys below the MSRP. All three of the Gym Dandy Teeter Totters are among some of the highest rated toys that we’ve seen. We’ve seen no reports of structural-type failures that we found among some of the swing sets we researched. The seats are a bit of an issue but, overall families are very happy with these cool outdoor toys. With the non-spinning teeter totters, the TT-320 (sometimes referred to as the “deluxe” model), has a different swing system that increases the weight limitation by 100 pounds to 400 pounds. It also comes with a safety cable lock system to prevent unsupervised play. That increased strength, does however, make the teeter totter weigh nearly twice as much as the TT-210 model. 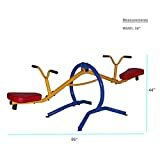 The Gym Dandy Teeter-Totter Home Seesaw (TT-210) is a more traditional see saw with an up and down movement, padded seats and can support riders up to 300 pounds in total weight. The Gym Dandy Pendulum Teeter-Totter (TT-320) has a patented pendulum system to provide a smooth seesaw rocking motion, padded seats and supports up to 400 pounds in total weight. The first thing we always look for when recommending a toy which requires assembly is how much information is available online. With both of the Gym Dandy teeter-totters, we found an online and downloadable PDF version of the manual. The manual lists a toll-free customer service number which is staffed M-F 9am – 5pm PST. There’s also email address if you would prefer to communicate with the company electronically. If our math is right; there are 71 parts, mostly bolts and washers, with the Gym Dandy Teeter Totter (TT-210) and 112 for the Gym Dandy Pendulum Teeter Totter (TT-320). Each component is identified with a picture, quantity included and the size (in inches). We didn’t see any complaints on families running into difficulty assembling their see saws. Families reported needing 1-2 hours for assembly. While it is possible for one person to assemble these cool outdoor toys, assembly would be quicker and easier with two. The Marcy Gymnasium Equipment Company was founded in 1959 by Walter Marcyan, a champion weight-lifter and founder of the House of Health strength training gymnasiums. The company began by offering weight and strength-training equipment. Their toys are some of the strongest we’ve found with weight restrictions far higher than most toys built for 3-10 year olds. Older children, parents and grandparents can easily join in the fun without fear of injury or damaging the toy. The heavy-duty frame is made from premium-quality steel with a weather-resistant powder coat finish to help protect against corrosion and rust. The padded seats are large enough for parents to sit comfortably or for an older child or parent to ride with a younger child. Bump absorbers under each seat help provide riders with softer landings. If you want to ensure even softer landings, you could plant an old tire in the ground under each seat to further prevent hard landings. The rubber handles help even the youngest of riders remain safely seated on the Gym Dandy Teeter-Totters. All four feet have pre-drilled holes to allow families to stake their teeter totter to the ground to protect riders. We didn’t see any complaints of the teeter totters tipping but we would certainly recommend using some garden stakes to add an additional level of safety. Teeter-totters should be placed at least six feet away from structures, trees, bushes, fencing and other hard surfaces. Non-riders and pets should be kept at least 5 feet away from the toy when in use. Riders should refrain from standing on any part of the teeter-totter as it could damage the toy and result in injury. Children should not be permitted to use a Gym Dandy Teeter-Totter without another rider. Riders shouldn’t wear loose clothing and wearing closed shoes will help protect their feet. After reading literally hundreds of reviews for the Gym Dandy Teeter Totters, the seats do appear to be an issue. While the fabric-covered cushions are comfy for both children and adults, it does seem that they do not always hold up under inclement weather. The seats are warranted for 2-years. The manufacturer has responded to complaints about the seats in customer reviews and asked families to call customer support for replacements. Unfortunately, it seems while some families are receiving replacement seats free of charge, others are being asked to pay for the replacements. Our suggestion would be to protect the seats from moisture as much as possible. If you aren’t using this toy inside or in a weather-protected location, we would strongly recommend you protect the seats from moisture when the toy is not in use. You could simply use elastic bungee cords and garbage bags to cover each seat. Or, you could cover the entire toy with a large tarp like the Hanjet Tarp Heavy Duty Waterproof Camping Tarp – just be sure to purchase one large enough to cover the Gym Dandy Teeter-Tooter from end to end. One family protected their seats by using vinyl spare tire covers to protect the seats. We believe, as do most families who are enjoying the Gym Dandy Teeter Totters, that the seat issue is a problem, but one that can be mitigated by covering the seats when the toy is not in use.